One of the things I love about genealogy is being able to make a big discovery by piecing together tiny discoveries. As I mentioned in a previous post, William and Olive Rathkamp are the only great grandparents of mine for which I have no pictures. Not a single picture that I know of has made its way through the generations. They’re also, by far, the strangest of my ancestors as I wrote here. I discovered William and his first wife, Sophie (she passed away in 1906) , in the 1905 Minnesota State census, living in St. Paul. I’m not sure how they ended up in St. Paul, but the census states that they had lived at this address for 3 years. 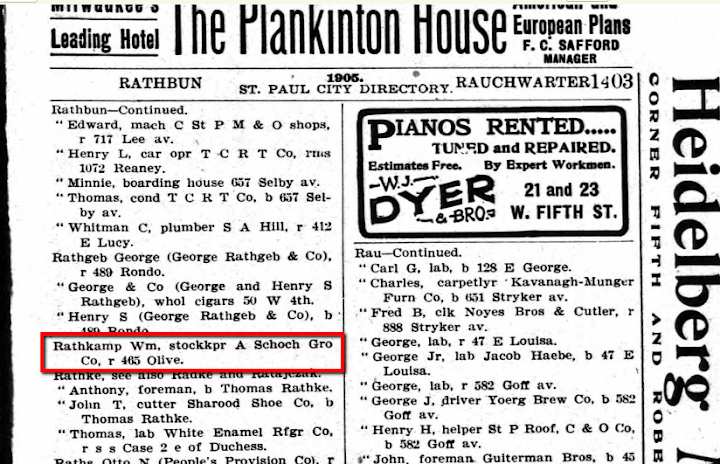 There is a distant branch of the Rathkamp tree that settled in Minnesota, but I’m not sure of any sort of tie there. The Wetenkamp, Finke, and Hulsemann families settled in Minnesota too, but that was in Martin, some 160 miles away. These were relatives and friends from Germany who came to America with the Rathkamp family in 1868. At any rate, I was able to find William in the 1905 St. Paul city directory. His entry stated that he was a stock keeper for the A. Schoch grocery store. On a whim I did a Google Image search and was able to find this picture, taken circa 1905. As soon as I opened the picture I was drawn to the man on the very left in the front row. There was no doubt that this was my great grandfather. I also sent a message to family members on Facebook and asked them, “If I were to tell you one of the people in this picture may be a Rathkamp, which would it be?” Everybody picked the same person. So while the picture I’ve found may not hold up as evidence in court, I feel 99.9% confident that I now know what my great-grandfather looks like. Nice to meet you Willie.